As with every Federal Open Market Committee (FOMC) statement day, there is a model for the stock market to follow pre and post announcement. Certain environments have very strong tendencies while others do not. Over the past few meetings, many of the strongest trends immediately before and after were muted except for a modest post FOMC trend last meeting which called for mild weakness the very next day. The S&P 500 lost 10 points or -0.40%. 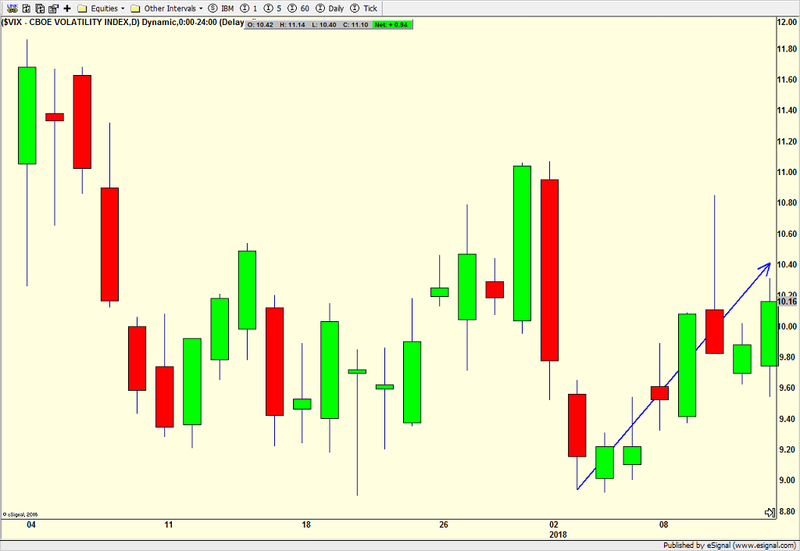 After the stock market’s decline over the past two days, one FOMC trend said to buy yesterday’s close. That was a strong signal. I was really hoping for a lower opening today for a few reasons. First, the third straight lower open is usually a good buying opportunity in a bull market. Second, it would have triggered a number of bullish short-term studies for the next one to two weeks. Finally and most importantly, a lower open would trigger two of the most powerful FOMC trends to buy the S&P 500 at the open. As Robert Burns said “the best laid plans of mice and men often go awry”. Stocks seem poised to bounce back at the open rather than decline. The next model calls for stocks to close higher today and rally after 2:00 PM. That is usually a very strong trend, 80%+, especially after seeing weakness into statement day (today). Finally, assuming stocks close higher today, there is a trend setting up for a post statement day decline, but that is not a certainty just yet. No Rate Hike But All the Wrong Moves for Yellen & Co. This is Chair Janet Yellen’s final meeting as chairman as well as final meeting sitting on the FOMC. With the Fed raising interest rates only 6 weeks ago, today’s meeting should be very unexciting. The next real opportunity for a rate hike will come at the March meeting. Remember, the Fed forecast one to two rate hike in 2018. I continue to believe the risk is to the upside for three to four increases. I want to stop for a moment and rehash an old, but still troubling theme. I am absolutely against the Fed hiking interest rates AND reducing the size of its balance sheet at the same time. It’s an unprecedented experiment and the Fed doesn’t have a good track record in this department. Pick one or the other. Stop worrying about ammunition for the next crisis. Given that the Fed has induced or accelerated almost every single recession of the modern era, I have no doubt that the recession coming before the 2020 election will certainly have the Fed’s fingerprints on it with their too tight monetary policy experiment. 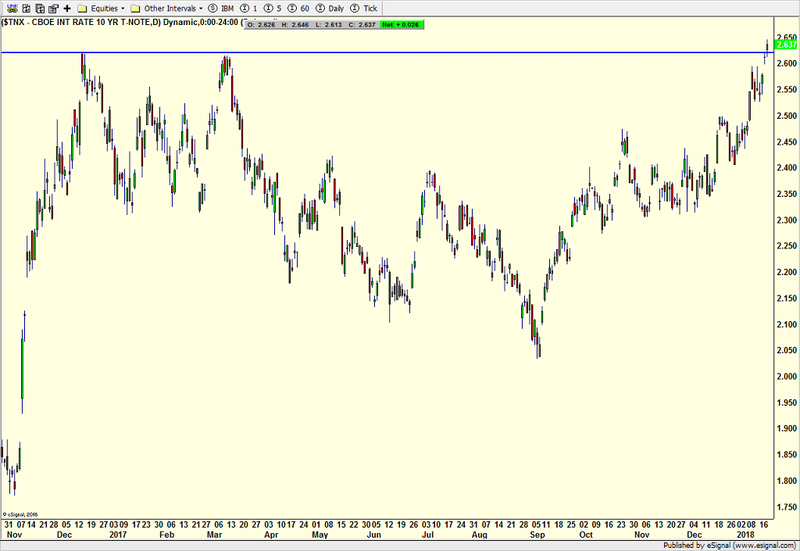 Below is a chart I have shown at least quarterly since 2008. With the exception of a brief period from mid 2009 to mid 2010, the velocity of money collapsed. It’s still too early to conclude, but it does look like it stopped going down in 2017. In the easiest terms, M2V measures how many times one unit of currency is turned over a period of time in the economy. As you can see, it’s been in a disastrous bear market since 1998 which just so happens to be the year where the Internet starting becoming a real force in the economy. Although it did uptick during the housing boom as rates went up, it turned out to be just a bounce before the collapse continued right to the present. This single chart definitely speaks to some structural problems in the financial system. Money is not getting turned over and desperately needs to. The economy has been suffering for many years and will not fully recover and function normally until money velocity rallies. Without this chart turning up, I do not believe the Fed will create sustainable inflation at 2% or above. This is one chart the Fed should be focused on all of the time. It would be interesting to see the impact if the Fed stopped paying banks for keeping reserves with the Fed. That could presumably force money out from the Fed and into loans or other performing assets. It continues to boggle my mind why no one calls the Fed out on this and certainly not Yellen at her quarterly press conference. In March, perhaps someone will question Chair Powell on this! On Monday we learned that stocks can actually decline in 2018. On Tuesday, we are about to find out that stocks can go down on back to back days and accelerate lower. People seem to have forgotten that! With a trading range/pullback setting in, I am looking at Dow 25,800 as a logical downside target, but of course, we could go a bit lower. Semis, banks and discretionary are acting well and transports aren’t horrendous. There is news just out about Amazon, Berkshire and JP Morgan getting into healthcare on a non for profit basis so I would expect significant weakness in the healthcare sector today. Tonight, we have the State of the Union and tomorrow the Fed will conclude their two day meeting without any action in rates. It will be interesting to see where stocks close versus where they open to get a feel for short-term mood. Any sign of the “melt up”? On Wednesday at 9:20 am I will be with Laura Hutchinson on WTNH (ABC in CT) unveiling my top financial resolutions for 2018 with a special focus on those directly impacted by the tax reform bill passed last month. It has been one heck of a start to 2018 in the stock market with some of the strongest momentum in history. As I have mentioned a number of times, animal spirits were released into the economy and markets a year ago and they seem to have been re-released late last year. Historically, those are not extinguished so quickly. In short, all five major stock market indices are in sync to the upside. All four key sectors are leading and acting very powerfully. There is broad participation in the rally as measured by the New York Stock Exchange’s Advance/Decline Line. And high yield yield bonds are behaving at least okay. While pundits have been calling the stock market a “bubble” for years, price behavior isn’t supportive of that just yet. My primary concern is that after an almost 20,000 point rally in Dow, the masses have finally embraced the bull market and are going “all in”. Sentiment surveys and individual investor behavior in the options market are showing euphoria. When the historic momentum begins to fade, the euphoric mood will matter, but that should not be right now or soon. I keep hearing from the remaining naysayers that “this is going to end badly”. Well, no kidding! All, and I mean every single bull market ends badly or they wouldn’t end. Not a single bull market in history ended quietly without ensuing pain. Those who are late to the party and do not have a plan to book gains, hedge or play defense will certainly see decimation in their portfolios, just as they have during every single bear market in history. That’s just the way investing goes. Just ask all those Bitcoin investors who thought it was a one way street to untold riches. The 50% decline happened in the blink of an eye. While stocks will likely see a full-fledged correction later this year and an increase in volatility well before that, the landscape still favors the bulls as even the slightest signs of weakness are immediately bought by those who have been sitting on cash. As the saying goes, “don’t confuse brains with a bull market”. Last week I offered the idea that stocks may be settling into a little trading range before resuming the rally. 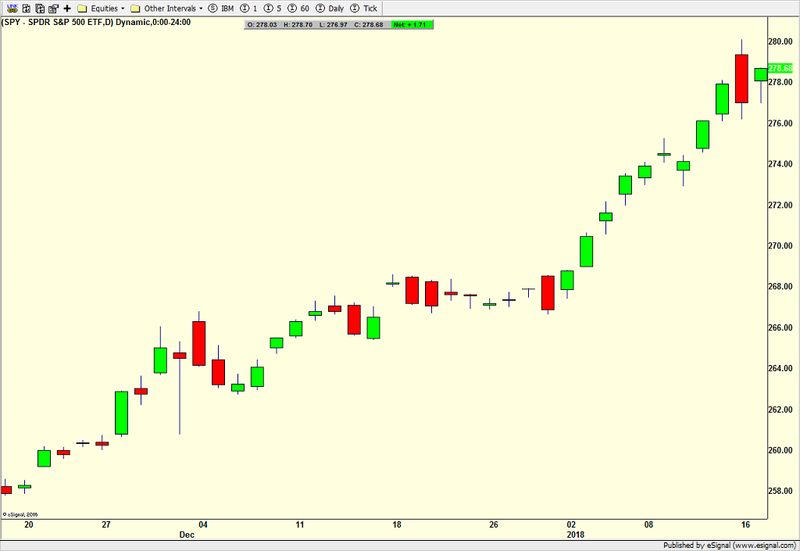 Well that lasted all of one day as the bulls continue to press higher to begin the new week. Time and time again this market has punished any and all who dare to hold cash or, heaven forbid, short the market or hedge. As continue writing my year-end report to clients and I review commentary, I realized that for 20 months, the stock market has completely steamrolled almost all of the short-term negative studies as well as the seasonal (calendar) ones. That’s pretty incredible and something without precedent in my 100 year database. So here we are with all five major stock market indices at all-time highs. There’s not much more to say. Semis, banks and discretionary at new highs. Transports not far behind. NYSE A/D Line at fresh highs. Only junk bonds are lagging, but they look like they could score new highs sooner than later. 2017 was relatively easy for the bulls. 2018 has started off even easier. I am concerned that few others are concerned and people are starting to believe in a new paradigm of permanently higher stock prices. That’s very dangerous. I hear pundits saying that all this won’t end well. While that’s true, no bull market in history has ever ended well or it wouldn’t have ended! Everyone should enjoy what’s going on in the stock market, but realize that this behavior is generational and won’t likely be repeated for a long, long time. Two days ago, I wrote about a vicious, nasty and wicked reversal across the stock market. While the pundits and naysayers concluded various bearish scenarios, history and facts didn’t back that up to any strong degree unless you wanted to cherry pick. More times than not, after a one day, ugly reversal, a short-term trading range sets in, which I see occurring right now. Interestingly, the biggest reversals this week were seen in the S&P 400 and Russell 2000 and those are the two indices which seem to offer the best upside right now. Semis, software and homebuilders have already overrun their reversal days with a few more sectors getting closer. It certainly wouldn’t be a bad thing to have stocks pause and digest here. Intermediate and long-term studies continue to suggest higher prices while short-term studies, which have been wrong for months, suggest otherwise. The real story is in the bond market where the yield on the 10 year note is breaking out. More on this next week. No sooner did the ink dry on yesterday’s blog than the markets saw a very ugly and wicked reversal which saw the Dow give up almost 400 points from high to low. The “feel” I wrote about turned out to be prescient pretty quickly as volatility spiked in a huge way on a relative basis. 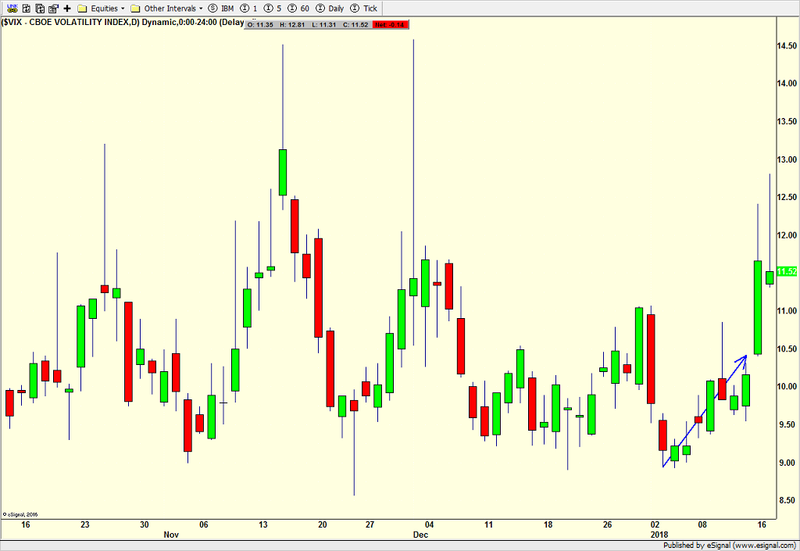 Check out the chart of the VIX below over the last two days. 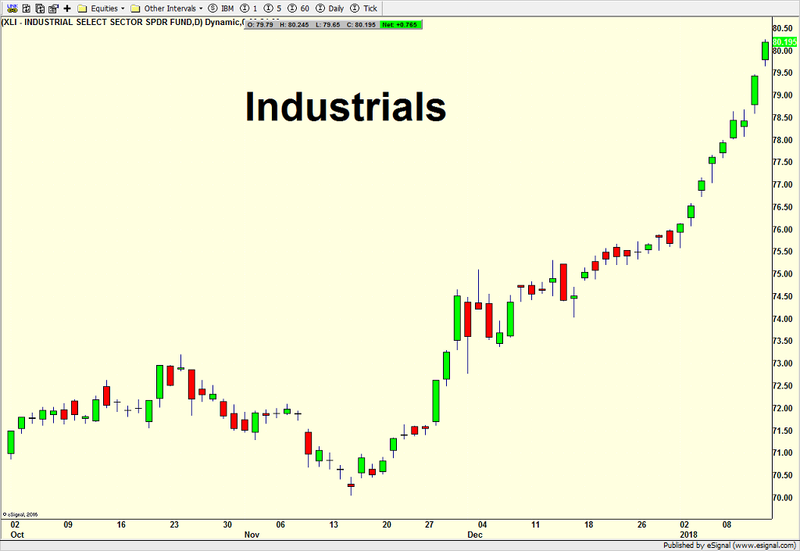 When you look at any of the major indices, sector or stocks, you will see what looks like a horrid reversal on the candlestick charts with prices opening at the top of the candle and closing at the bottom, a tall, red candle. The S&P 500 and Russell 2000 are below. Most of the sectors look very similar to the indices so I will pick on biotech as it gave back the most ground I could find. While these reversals look absolutely terrifying on the surface, especially when we hear pundits invoking the peaks in 2007 and 2000, historically, their bark is worse than their bite. Some do lead to declines with some declines of major significance. However, most just lead to a short-term bout of weakness or a mild pullback. Several other warnings would need to be present before I would consider one of these reversals to be ominous. Of note, high yield bonds finished higher on Tuesday along with consumer staples which is now on breakout alert. Utilities are the sector which has been decimated as bond yields have jumped. They are getting close to an area where regardless of where they are ultimately going, a rally should begin. I wrote about volatility picking up and that’s exactly what’s happening now. However, contrary to popular opinion, bull markets do not end with volatility just increasing from all-time or yearly lows. It’s months or more to work that higher before a bear even becomes possible. Breaking the back of a bull market is not a point in time. You can certainly expect the bulls to make a stand sooner than later. A new week begins and to no one’s surprise, stocks are set to open sharply higher. Even during the Dotcom bubble, stocks took a breather every now and then. In fact, they became very volatile during their melt up phase. That’s an element that has been lacking during this leg of the bull market.It’s not a great chart, but take a look at the volatility index below, also known as the VIX. Essentially, since the year began, this index has gone up along with stocks, That is very unusual behavior as historically, stocks and the VIX move inversely, meaning they move in opposite directions. Behavior like this would typically lead to a pullback in stocks, but as we have seen time and time again, this is anything but a normal market environment. It’s something to keep an eye on. I hate to use the word “feel” because as my golf coach would always lecture, “feel is not real”, but I do get the feeling that one of these sharply higher openings is going to be met with a nasty reversal to the downside. It may only last a day or even a week, but it should look a bit ugly. In this case, the VIX should likely spike higher than normal. Again, we’ll see. Stocks continue to do nothing wrong to derail the bull market. The major indices are all in gear to the upside. Sector leadership is very strong. 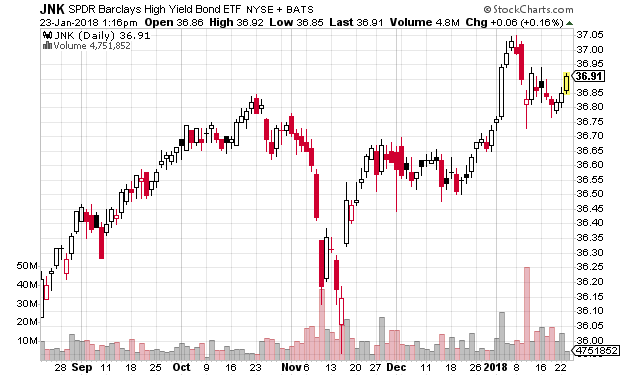 High yield bonds are participating. The NYSE A/D Line is making new highs. Nothing suggests an imminent end to the bull market, no matter how uncomfortable price action makes you. After finally seeing a down day, the bulls came right back to work on Thursday with a blistering effort and very strong internals. 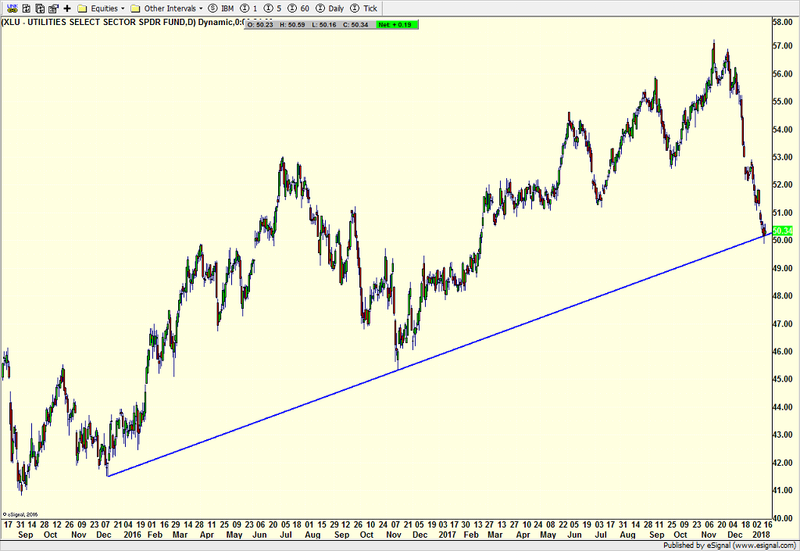 That trend looks likely to continue into the holiday weekend. 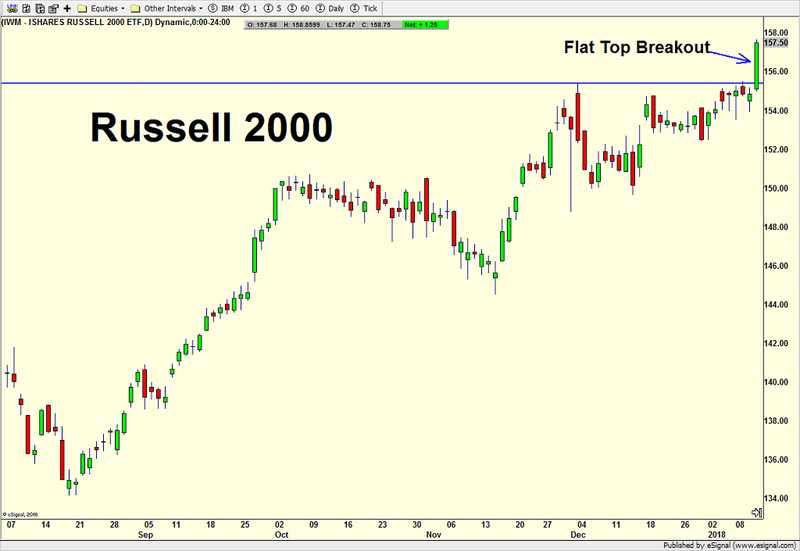 The real star of the day was the Russell 2000 index of small cap companies which had generally been consolidating nicely before bursting higher. You can see the blue line below which shows a ceiling where price has stopped three times before, also known as a flat top. 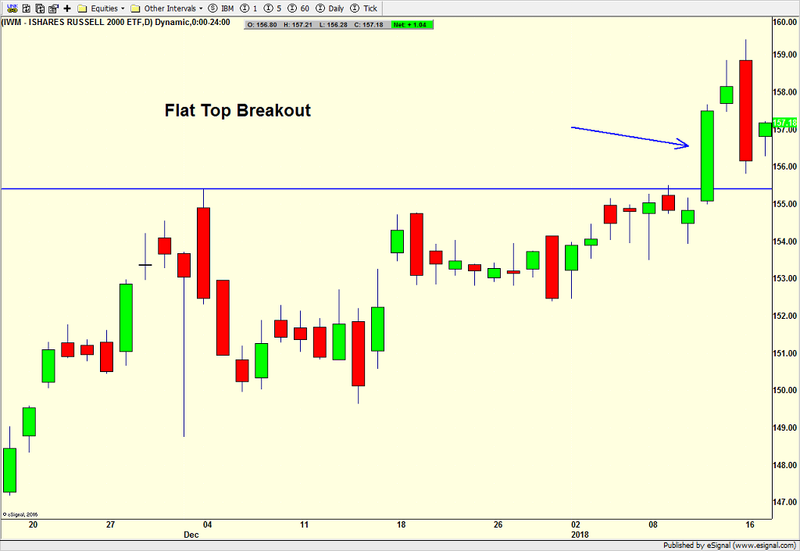 Once price breaks out above the flat top and closes above it, it is typically a very positive sign. Unless small caps fail right here and close back below the blue line next week, they should continue to move higher and lead. Looking like a Dotcom stock or Bitcoin, these two stodgy old sectors are in melt up phase. Both industrials and transports have been overpoweringly strong. 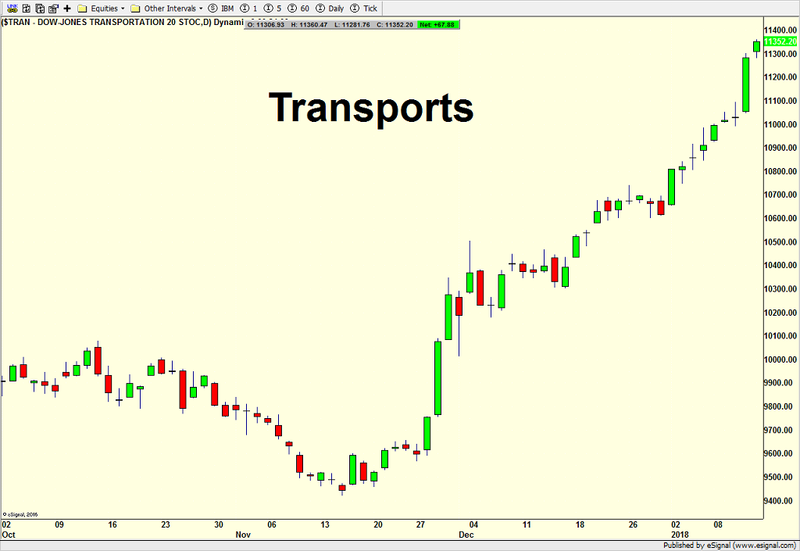 I wrote about the bullish potential for transports near the bottom in November and they have exceeded my wildest upside projections so quickly. One Down Day. New Bear Market? 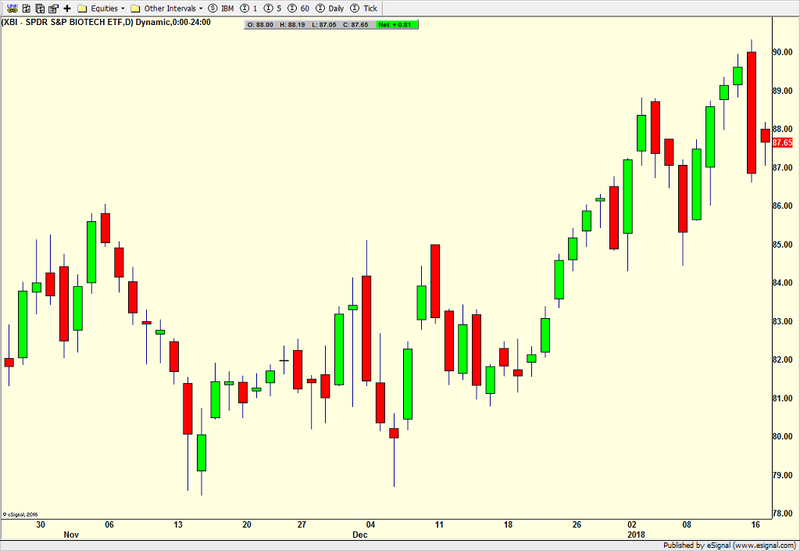 In what continues to be an epic start to the New Year, the stock market finally did see a down day, albeit very small. The major indices closed fractionally lower without any damage being done. Yes, some have mentioned that the rally is “narrowing”, meaning less participation, however the NYSE A/D Line just hit an all-time this week. That’s a hard case to make that trouble is looming. Other have noticed that some of the weekly employment data is just beginning to soften and that sometimes leads to recession 6-18 months later. Okay. No arguments. High yield bonds? While they are down this week, they have certainly kicked it up a notch over the past new weeks. With all of the major stock market indices at all-time highs and in gear to the upside, it’s really hard to find fault here for more than a mild pullback. As I continue to offer, strength does beget strength. On the sector front, leadership is very, very strong, especially for so late in a bull market. Banks didn’t wait long to reward my forecast of new highs this quarter. Transports and discretionary continue to soar higher. Semis revisited their November peak this week and have paused for the time being. Putting it all together, this is not the kind of behavior stocks typically see before a significant decline begins, let alone the end of the bull market.